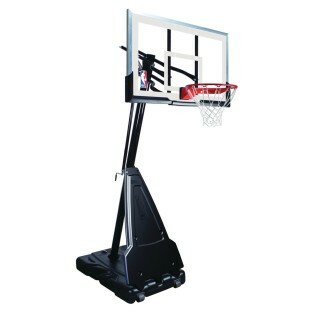 Spalding® Portable Basketball System 54"
54"W acrylic backboard supported by a steel frame. Adjust rim height from 7-1/2' to 10'. Screw jack lift system features a removable handle. Includes 2 wheels for portability and an arena slam rim. Portable basketball backboard system features a 54" wide acrylic backboard supported by an exterior steel frame. Rim height can be adjusted from 7-1/2' to 10' with the screw jack lift system that features a removable handle. Backboard is supported by a 3-piece, 3-1/2"-diameter pole that sits on a large plastic base that can hold up to 40 gallons of water or sand. Includes 2 wheels for portability and an arena slam rim.